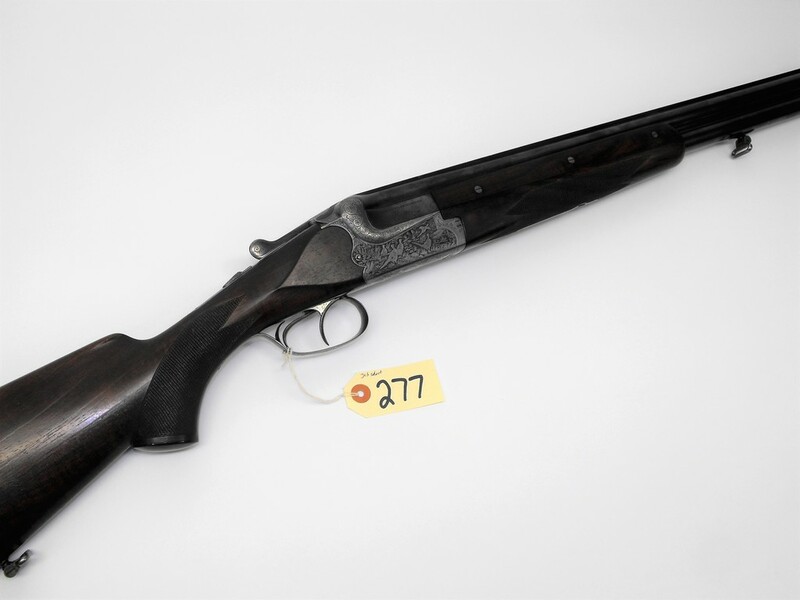 (CR) Merkel 201E Pre War 12 Ga.
Over-and-under with auto ejectors, full choke, solid rib, boxlock, double trigger, ivory bead, elaborately engraved frame, raised cheek piece stock, 28 1/2" barrel, SN 24844. Made in 1937. 14 1/4" LOP. Includes a copy of the production card. Condition: Some normal wear but in overall great condition. Mirror bores. Conditions of Sale Terms & Conditions Firearms Online Terms & Conditions All firearms in this auction that have a (R) in the description are considered modern firearms and will need a NICS background check completed unless you are a dealer holding a FFL license. All firearms in this auction that have (C&R) in the description need to have a NICS background check done unless you carry a Curio & Relics license or an FFL license. All firearms in this auction that DO NOT have a (R) or (C&R) in the description DO NOT need a NICS background checked and can be picked up or shipped directly to your door UNLESS a mistake was made when cataloging and it should have been marked with a (R) or (C&R) FIREARMS LAWS. You must be 21 years of age to purchase a hand gun and 18 years of age to purchase a long gun. Photo ID is required to run a background check. All firearms are sold in accordance with Federal and Pennsylvania State Laws. All post - 1898 (Modern) firearms must be registered in compliance with Federal and State Law. Purchasers of Modern firearms who are Pennsylvania residents must complete state and federal registration forms at Pa Auction Center 3164 White Oak Road Quarryville Pa 17566, or provide a signed copy of a Federal Firearms License from a dealer that your purchase can be shipped to. FFL Dealers and out-of-state buyers must have in their possession on the day of sale, signed copies of their Federal Firearms License in order to accept same-day delivery of modern firearms. Buyers who act as agents for FFL dealers must have a letter of agency as well as a signed copy of the dealers Federal Firearms License (FFL). Internet bidders who are out-of-state buyers and FFL dealers must fax a current FFL license within 48 hours of the close of the sale to Pa Auction Center 717-687-8819. Curio & Relic FFL licenses will be accepted on auction lots indicated in the description '(C&R)'. All Firearms sold only to US Residents. SEE PARAGRAPH 17 for additional STATE Restrictions.